I found this bike leaning against a building in my neighbourhood. It was covered with post-it notes on which a man had written declarations of love for all to see. The bicycle belongs to the girl in question. Her name is Stine. There was a variety of messages. The one on the left reads "Will ALWAYS love you. SORRY for all my flaws." On the right it says, simply, "Love you." There were several post-it notes in the basket that had fallen off. This one on the seat reads, "Love you, Stine." A wonderful, public display of affection. What better than a bicycle to do so. A unique and novel way to declare love. May they cycle off into the sunset!! so romantic! i will do it wiht my husband! hi raquel. just checked cafe press. the online shop is fine on my end. Cute! But was someone in the doghouse? i will try it again! thanks! That's cool. Post-its put to good use. 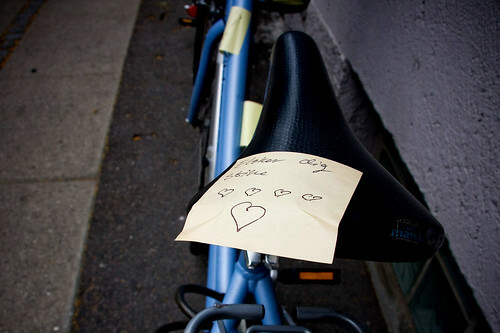 notes on bikes is one of the sweetest things. 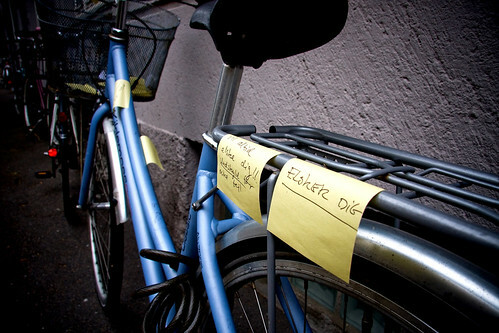 i met a great guy by leaving one of these 'your bike is hot" slips (http://yourbikeishot.com/yourbikeishot.pdf) on his bike and writing a note on the back.